What's a motorcycle? Simple question, right. Even my friend's 3-year-old can identify one. Some excited, would-be owners of the new Polaris Slingshot three-wheeled roadster are finding out the question is not as simple as they'd like it to be. Some states are balking at issuing motorcycle titles and registration for the Slingshot because it does not meet the letter of the definitions in state laws. 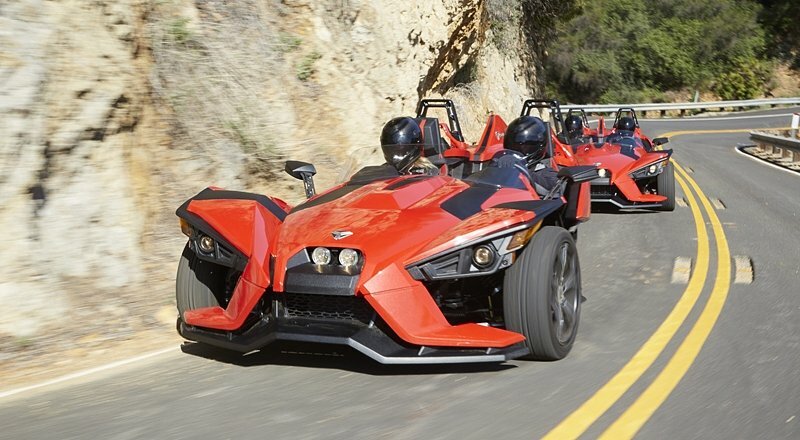 Sales of the Slingshot three-wheeler have been delayed indefinitely in some states and buyers who put down deposits are venting their anger on state bureaucrats, state legislators, Polaris, dealers, and occasionally each other in online Slingshot forums. Some complain they sold their one and only motorcycle, or a Corvette, or other high-performance toy to make room in the garage for the $20,000 Slingshot, only to be denied. The vibe is not pretty. No "handlebar" or "saddle" here, so Indiana and Texas don't want to call the Slingshot a motorcycle. Polaris photo. The problem in Indiana seems to be the word "handlebar." Motorcycles are supposed to have one, under the state's definition. The Slingshot has a steering wheel. In Texas, the sticking point is "saddle." You sit on a motorcycle like you would a horse, not in a bucket seat. The Slingshot's fate is still up in the air in Connecticut, too, where a meeting is scheduled for today between dealers who want to sell it, Polaris officials, and Department of Motor Vehicles officials who so far have not agreed that it meets the definition of a motorcycle. In Texas and Indiana, at the very least, it appears legislative action will be needed to change legal definitions and allow sales of the Slingshot. Who said something with a steering wheel is a motorcycle, anyway? While defining a motorcycle may seem like child's play, it has actually been the subject of a lot of debate and government officials' time at both the federal and state levels, in the past. Generally, definitions start with "not more than three wheels," but individual state laws vary. Why does it matter? Because the only way something like the Slingshot can be sold and operated on the roads legally in the United States is if it is considered a motorcycle. With no crashworthy front bumper, not even a hint of a rear bumper, no airbags, no side impact protection, etc., etc., it could never be sold as a car. Angry Hoosiers and Texans aside, the definitions as written in those states' laws do make some common sense. You're strapped into a bucket seat, turning two front wheels using a steering wheel, shifting gears with a handshift lever and accelerating by pressing a pedal with your foot — does any of that feel like riding a motorcycle? Slingshot fans scream foul, noting that the Campagna T-Rex has been seen on their roads. What do you think? Should the Slingshot be titled as a motorcycle?